Few things in life can give you a bigger buzz than surfing. It’s a unique experience and a lifestyle at the same time. And there is nothing better than going for surf - it's very good for both body and soul. At Silver Coast, we share our surfing knowledge and experience so that everyone can enjoy the ocean as much as we do. Prepare yourself to get rewarding experiences, have loads of fun and meet new people who share your sense of adventure and new passion for surfing. Year round group and private surf lessons with instructors certified by the Portuguese Surfing Federation. Lisbon airport pickup and drop off service. Guided surf trips for advanced surfers. Various accommodation options, depending on your preferences: houses, apartments or small studios – everything 50–200 meters from the ocean. Silver Coast is the licensed surf school, and our instructors are skilled surfers certified by the Portuguese Surfing Federation that have many years of ocean and surfing experience. All Silver Coast instructors are masters of art of teaching surfing, have lifesaving and first-aid skills and will help you to catch the wave of your dreams, whether it’s your first time setting foot in the ocean or you’re a surf fanatic looking to ride some bigger waves. Our team of instructors is very carefully selected among those with best surfing knowledge, pedagogical experience, excellent communication and multicultural skills. Our teachers will help you learn quickly, while making sure you are as safe and comfortable in the water as possible. Look no further! You’ve found the best surf school for group and private surf lessons. Our lessons are for absolutely everybody no matter age, shape, size or fitness. Whether it’s your first date with the Atlantic ocean and you’ve seen surfing only in the movies or you simply want to improve your technical skills and style of surfing, we offer coaching that will make you reach your goals. Surfing is a journey that never ends as there is no limit to perfection. Bring your enthusiasm - we'll supply the rest. Our students are provided with all the equipment required in accordance with their needs and level of surfing. This includes surfboards, wetsuits and colorful rash guards (lycras) to identify Silver Coast students. Also you don’t have to worry about getting to the beach: we bring you to the surf spots with the best conditions for a certain day. Moreover, we want to show you what the surfer lifestyle is all about. It's all about good vibes, fun, friendship and Aloha. So join an exciting holiday full of surf, sun, smiles and adventures with Silver Coast surf school. With a selection of beaches that face different direction, we receive all the swells generated by storms of Atlantic. Whatever the combination of wind and swell chances are very high that you catch your best waves every day. 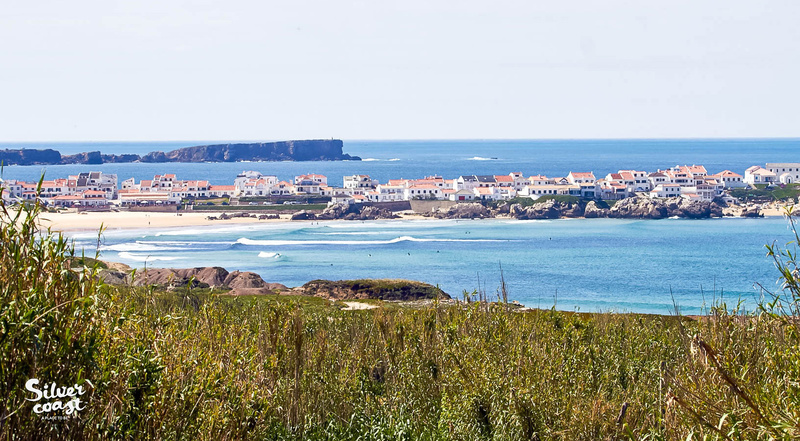 A broad sheltered bay between peninsulas of Peniche and Baleal is a perfect playground for beginners as well as experienced surfers. This is one of the most uncrowded stretches of the coast, and probably the easiest beginner surfing spot in the area. And with an incredible variety of other fantastic ocean spots to choose from, we always pick the right one for you to catch waves ideal for your comfort and experience level. We offer you an unforgettable experience, showing what surfing is all about. Taking safety very serious so we give our beginner classes at the beaches with a sandy bottom, we choose a spot taking our student’s surfing level into consideration, we only use safe, high quality soft top type surfboards for beginner classes and every student has his/her own sport insurance. Our surf programs consist of personalized beach instruction, lesson in the water, professional surf photography and video analysis back at the camp. We specialize in fun and safety, and our instructors work with the students in small well-structured groups, with the student-to-instructor ratio never more than 6:1, to ensure a safe and productive learning environment. In order to obtain the best results, we recommend that you take at least 1 week of surf lessons. This includes 5 days of surfing Monday through Friday with 2 surf sessions per day. We offer group and private surf lessons for all levels. And if you want to surf more you can always book your private surf session on weekend.